As Marvel Heroes 2015 prepares to transition to Marvel Heroes 2016, the folks at Gazillion held a PAX Prime panel, where they revealed new story instances, new characters, Team-Ups, costumes, visual updates, and controller support. The folks at Gazillion jumped into a Sunday PAX Prime 2015 panel to discuss what's next in their MMORPG, Marvel Heroes. As was noted a few weeks ago, the game is undergoing a name change, going from Marvel Heroes 2015 to Marvel Heroes 2016. Today, the panel offered the first details on this transition. After briefly discussing the vast roster, including a short chunk on the newly-playable War Machine, the 51st character in the game was revealed. 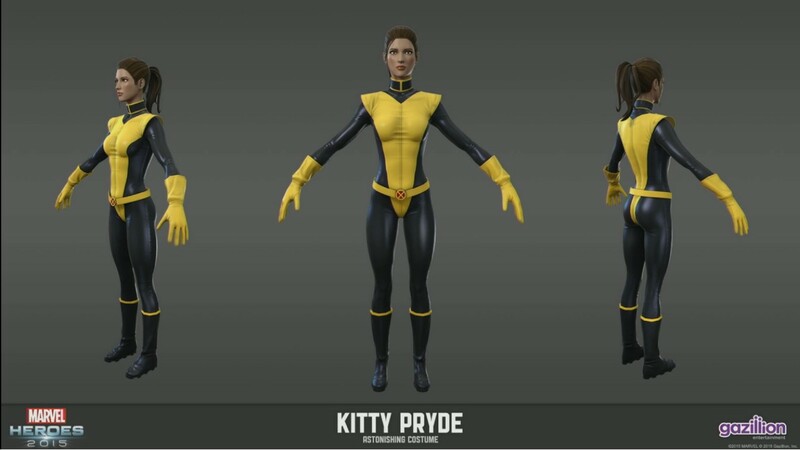 It's the X-Men's Kitty Pryde (a.k.a. Shadowcat), who brings a new set of agile melee abilities. And of course, she can phase through objects and use her abilities on the move. She'll also have a katana blade, from her training sessions with Wolverine. She'll also her faithful pet dragon, Lockheed, at her side, who will have his own moves and his own resource bar, which Gazillion CEO David Brevik notes will be like playing two characters at once. Future characters include vampire hunter Blade, stealthy thief and occasional Spidey love interest Black Cat, the mighty martial artist Iron Fist, and the fan-voted Magik. New Team-Up characters are also coming soon. After showing off the Carnage Team-Up trailer, the panel revealed the next characters to join the Team-Up roster. They include Agent Venom (the Flash Thompson-hosted version of the symbiote) and the X-Force version of Archangel. As for new costumes, the panel briefly talked about the Marvel Now! costume for Cable, who recently received his character revamp. Squirrel Girl will soon receive her Unbeatable Squirrel Girl costume, Moon Knight will get his Mr. Knight costume from his recent story arcs, Psylocke will get a House of M outfit, and Deadpool will get a Zen costume. Finally, the fans have spoken and Rocket Raccoon will get a Venom symbiote costume from a recent issue of Guardians of the Galaxy and he'll also come with Symbiote Groot, from that same story arc. The topic turned to Fortune Cards next, with new S.H.I.E.L.D. variant prizes coming soon. These include S.H.I.E.L.D. variant costumes for Hawkeye, Spider Woman, and Captain Marvel. The team then discussed the upcoming addition of the Danger Room, which long-time X-Men readers will recognize. This will open the door to randomized dungeons, which will include new loot for each run. More information on the Danger Room is coming soon. Finally, it was time to talk about the Marvel Heroes 2016 rebranding. 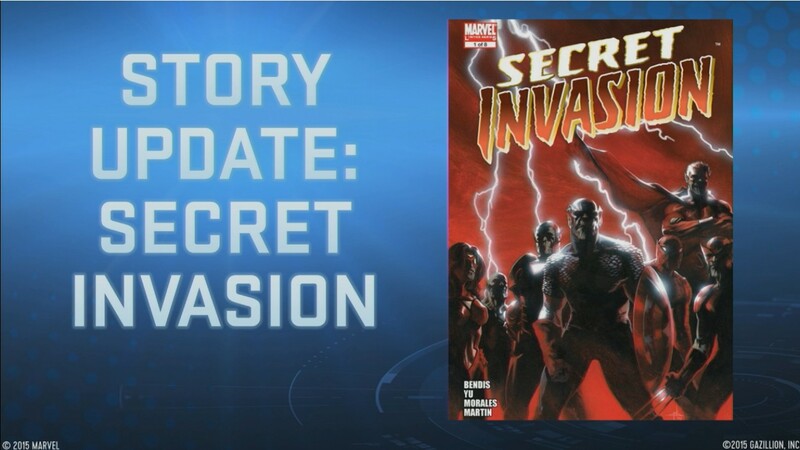 The next story instance will center around the Secret Invasion storyline, which comic readers will recognize as the tale where Skrulls infiltrated Earth and disguised themselves as various Marvel heroes and villains. Concept art for the game's story was shown, with Sandman smacking Luke Cage to reveal that the Hero for Hire/New Avenger was actually a Skrull in disguise. More information on Marvel Heroes 2016 is promised in the October issue of Game Informer magazine. Abigail Brand, leader of S.W.O.R.D., will be introduced as a new NPC to help rally the troops against new Skrull bosses, many based on Marvel heroes and villains. Skrull Commanders will also be introduced as new boss-type characters, as will War Skrulls, which will be Skrull amalgamations of various Marvel characters. An X-Men variant was shown, boasting Wolverine and Cyclops powers. And of course, Super-Skrull will be among those leading the invasion, as Kl'rt was revealed as one of the main bosses of the new story. Leaderboards are set to be introduced. However, Brevik notes that there will be a twist to the traditional leaderboard idea. More information will be revealed in the coming weeks. 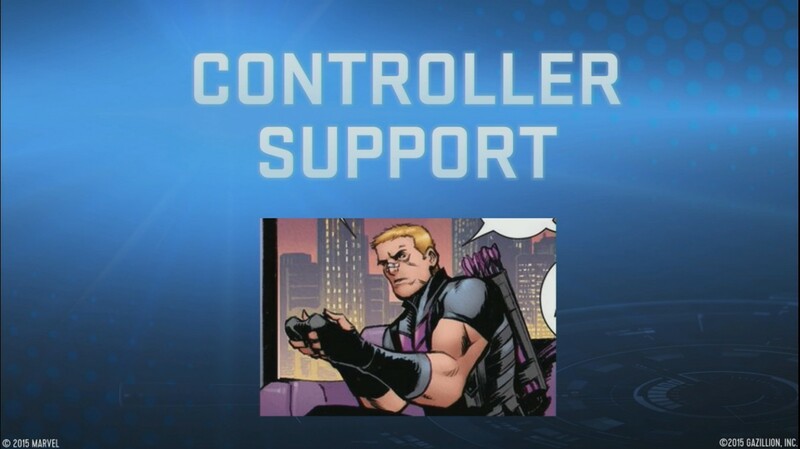 Marvel Heroes 2016 will also introduce controller support to the game for the first time, which is set to come around the update that will introduce updated visuals. Controller support would seem to point to the first step towards the long-awaited console port, but no word on that just yet. While the panel was asked about consoles, they simply stated, "It would be a lot of fun," and said nothing else beyond that. Future story instances will focus on the "All-New, All Different" line of Marvel, which is set to launch in the comics around October. This will center around characters, as well, with Captain Marvel set to receive her All-New, All Different costume. 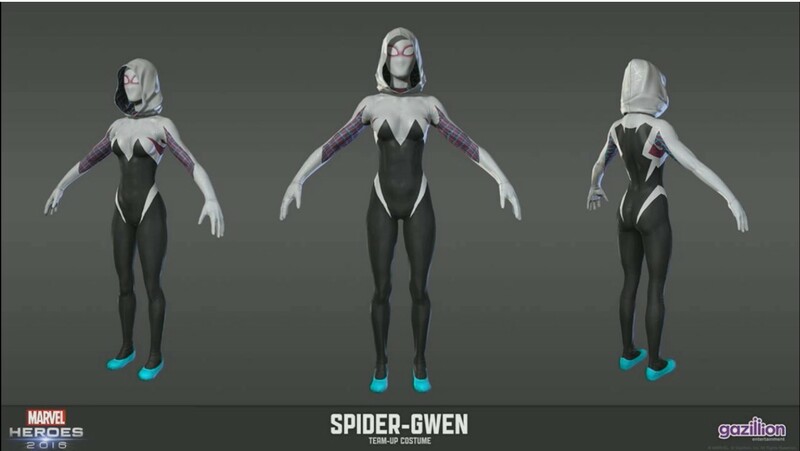 Thor will receive the female variant, while Spider-Man will also receive the Spider-Gwen costume that Brevik had originally teased back when he spoke to Shacknews at this year's Game Developers Conference. Finally, the Mac version of Marvel Heroes is finally set to come out of beta in the coming weeks. More details are forthcoming on that, as well as info on a new Raid that will star a major villain and a new Patrol Zone. Much of that information is expected to hit with the aforementioned October issue of Game Informer magazine. Update: As we wait for the panel to be uploaded, here's the Twitch archive, in the meantime. Fast-forward to the 1:22:00 mark to get right into it. Dang. Ran out of characters. And by "characters," I mean letters and numbers, not playable characters. There seem to be plenty of those. the dregs that no one really wants to play. Kudos to Mr. Brevik and co. for sitting through these Q&A sessions and answer the same topics over and over, he might come out sort of rude at times but he does this kind of stuff once a week on his personal stream, I love the guy! They really did a great job of "rescuing" this game from a mediocre launch. Also worried they have lost a few key people recently. Of course it might mean they are actually finishing up those additions and aren't needed. Who knows? key people like the lead content designer? wait, is there a MH pax code?